I am going to sound so fickle now - only yesterday I was declaring my love for the musings and recipes of David Lebovitz. Now here I am falling in love with a machine. I have room in my heart for many food related people and creations so don't think these are just mere crushes, I am true to them all! My latest object of desire, just a glance of a photo on the back of a catalogue wrapped in plastic and almost obscured by bills in the bundle of post on my colleague's deak, is a Kenwood Chef but not quite as I have ever seen one before. 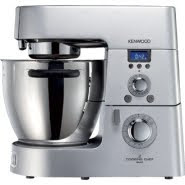 This is a Kenwood Cooking Chef as available in the UK through Nisbets. I am a Kenwood user, I haven't yet been able to work out how to put the bowl on a kitchenaid (and that makes for embarassing moments in the John Lewis home appliances department)! And I am not a natural gadget collecter, apart from the ice cream maker I have only bought a hand beater for my kitchen in the last twelve months. My mum was given a white and pale blue Kenwood Chef as a wedding present way back in the 60s and it was on this that I first starting mixing biscuits as a little girl. This same machine was the one toiled with me over endless cookie and cake mixes to create the first of my own recipe creations when I first started baking with the thought of farmers markets as the pinnacle of my career. Sadly relegated to the back of a cupboard but not yet thrown away, this has been replaced with several Chef Pro mixers which I use for recipe development along with a small army of Hobart mixers in the bakery. So I have a soft spot in my heart for Kenwood mixers, any machine that can still perform after 45 years has to be venerated in our society of built-in obsolesence. The Kenwood Cooking Chef, well, I am not sure where to start. Kenwood are being very shy about the machines attributes so that leaves me to guess ... A mixer that cooks? Not an obvious choice for a baker initially but I am sure that i can justify it somehow. What about for tempering chocolate, a low temperature heating the chocolate kept gently moving in the bowl? A hollandaise sauce? Icing? To be honest, I don't even know where to start, and whilst my imagination is yearning to be let loose, i have work deadlines so pressing that I have to put this to the back on my mind for now and concentrate on the task in hand. If you want to see this in action, Kenwood are hosting a series of launches across the UK in September and October, you can find details on their website here, you will need to check back for the dates as they haven't been posted yet. I have to get back to the business in hand for now and will leave it to you to dream on my behalf!